Engineering, Go for It (eGFI) is a site (I first mentioned eGFI a couple of years ago HERE) that provides a focused and engaging set of resources to get students excited about engineering. You can watch video clips (see below) of university students describing their engineering programs or learn about a specific field of engineering. The Etube section contains multiple engineering themed video clips while the Trailblazers section features readings and video spotlights on real working engineers. There is now a substantial collection of these clips.. with a diverse collection of scientists/engineers sharing their work. See embedded example below. The site also has a For Teachers section with K-12: lesson plans, class activities, outreach programs, web resources, and more. The lesson plans seem very well developed and contain downloadable documents, video supports, assessments, etc. 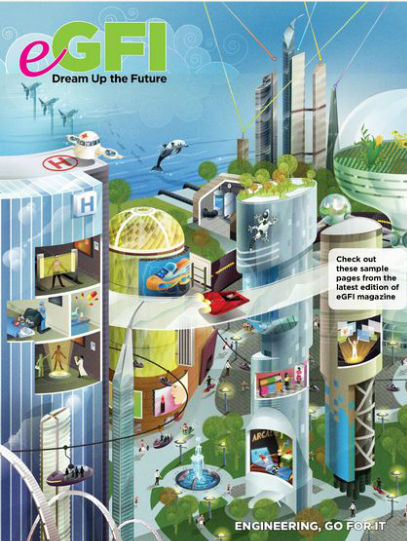 There is also a great interactive online magazine about engineering- check it out HERE. Applications for Science Teachers: Any district, school, or teacher looking to add some engineering focus to science instruction would be well served in checking out this site as a starting place. This entry was posted in design/engineering, STEM, Video. Bookmark the permalink.